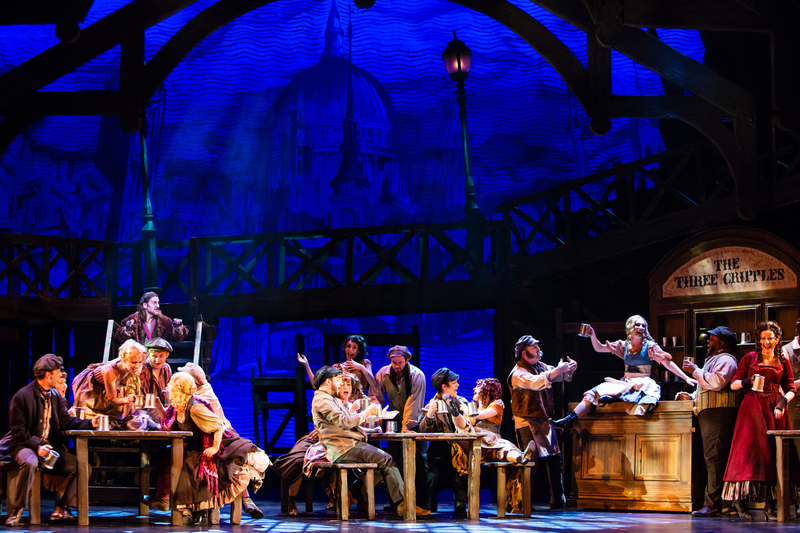 There is a pivotal moment in the Charles Dickens classic tale, “Oliver Twist,” when the hungry and naïve young orphan, Oliver, finishes the humble bowl of gruel he has been given for breakfast, and then dares to ask, “Please sir, I want some more!” Thus begin the many adventures of this young rebel, which in 1960 were brilliantly converted into what would become the legendary musical, “Oliver!” With its music, lyrics and book all the creation of composer, Lionel Bart, the show would debut in London, and then move on to become a Tony Award-winner after arriving on Broadway in 1963. 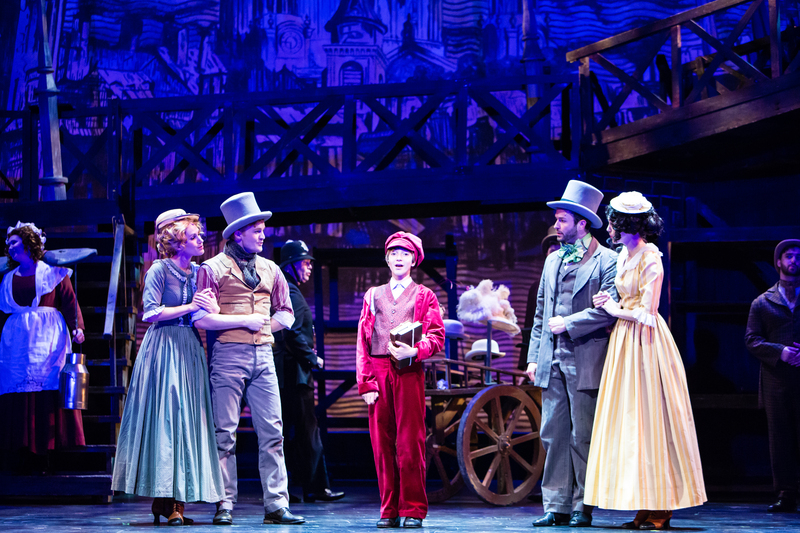 Caleb Donahoe as The Artful Dodger with the cast of OLIVER! 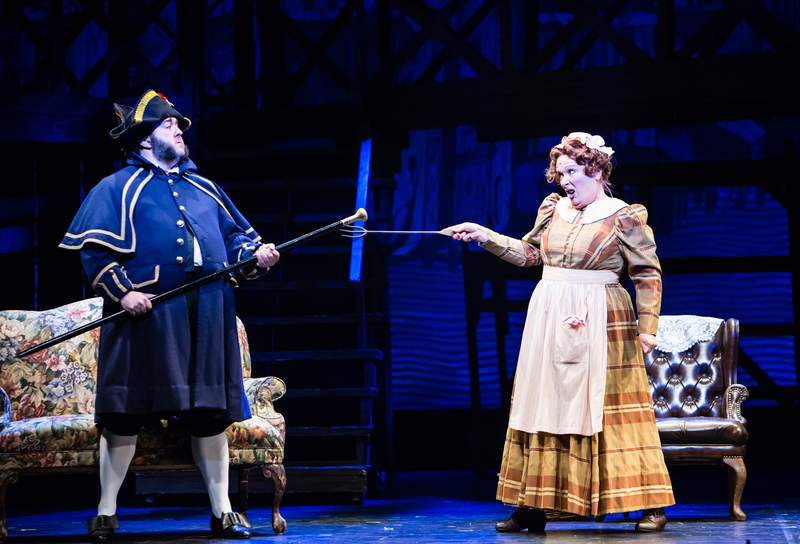 With a fine orchestra and musical direction from conductor, Wayne Green, this current TUTS production serves the lovely music well as it draws its greatest strength from the considerable vocal talents of its well-chosen cast. 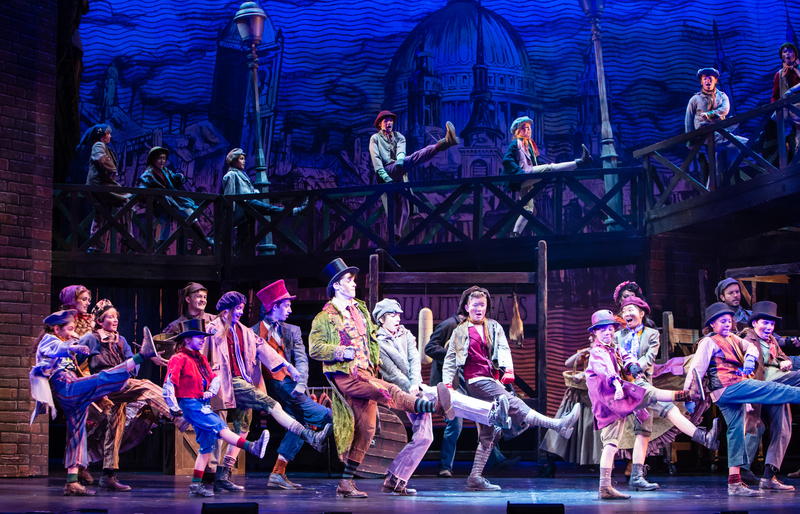 Frequent visitors to Houston’s Hobby Center may recall the fine performance of Christopher Wolff playing young Winthrop in last season’s TUTS production of The Music Man. 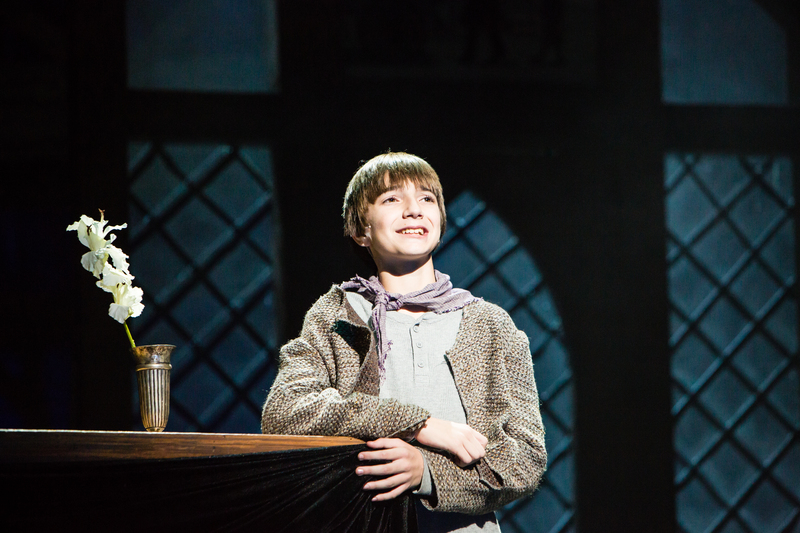 Here, even as we sense the beginnings of the voice change that will bring him to young manhood, Wolff again brings his fine boyish soprano to the title role of Oliver with lovely renditions of the memorable, “Where is Love,” and fine solo moments during the show’s splashy number, “Who Will Buy?” Oliver is one of the many abused young orphans in a workhouse overseen by the pompous and cruel Mr. Bumble (a sinister performance from Brian Ray Norris). Bumble is assisted by the equally sinister Widow Corney (Barbara Marineau), but at least the two find gleeful pleasure in each other’s company during the flirtatious fun of, “I Shall Scream.” Mr. Norris brings a deep rich voice to the ominous, “Boy For Sale,” when it is determined that troublesome young Oliver must be sold. Thus the boy faces still more cruelty when sold into the custody of the mean local undertaker, Mr. Sowerberry and his wife (Dylan Godwin & Gayton Scott). A sly old man named Fagin (James Leo Ryan) houses the boys in his hideout and instructs them in the art of thievery during the amusingly devilish, “You’ve Got to Pick a Pocket or Two.” Mr. Ryan brings a captivating sense of mystery to this number, and more especially to his Act Two performance of the thought-provoking, “Reviewing the Situation,” which finds him analyzing whether he should reform or continue as a thief. 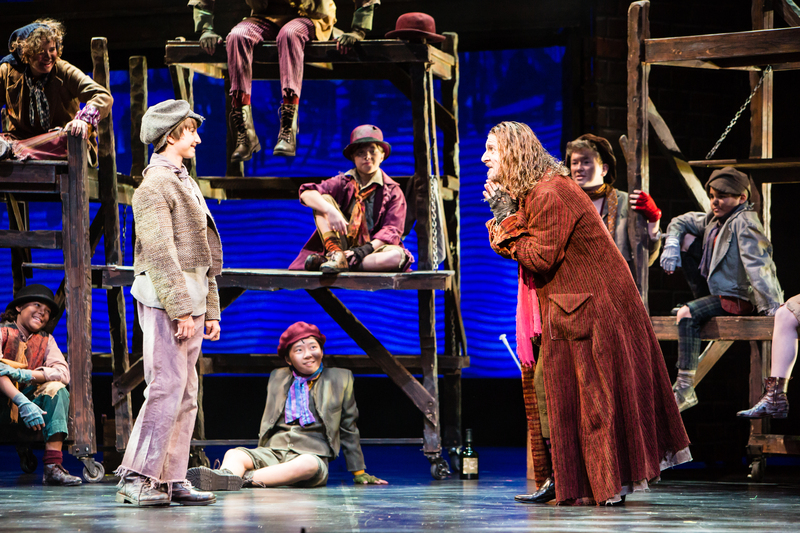 Caleb Donahoe as The Artful Dodger, Kathryn Porterfield as Nancy, James Leo Ryan as Fagin, and Nathaniel Hackmann as Bill Sykes. 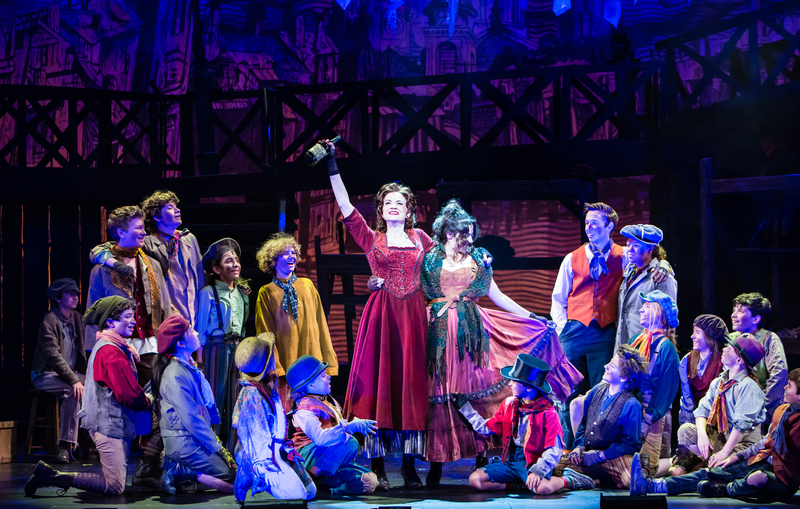 Kathryn Porterfield as Nancy and the cast of OLIVER! The latter, it could be noted, is not really politically correct in a modern world that scorns toleration of spousal abuse. But Porterfield and the full company joyfully open up the second act with the infectious and melodic charms of the lusty and lively beer hall song, “Oom-Pah-Pah.” It is an ensemble delight, much like both the show’s opening number, “Food, Glorious Food,” and the first act closer, “Be Back Soon.” The well-guided cast (Director, Bruce Lumpkin) features a great many youngsters from the Humphreys School of Musical Theatre at TUTS, and they have learned their lessons well. 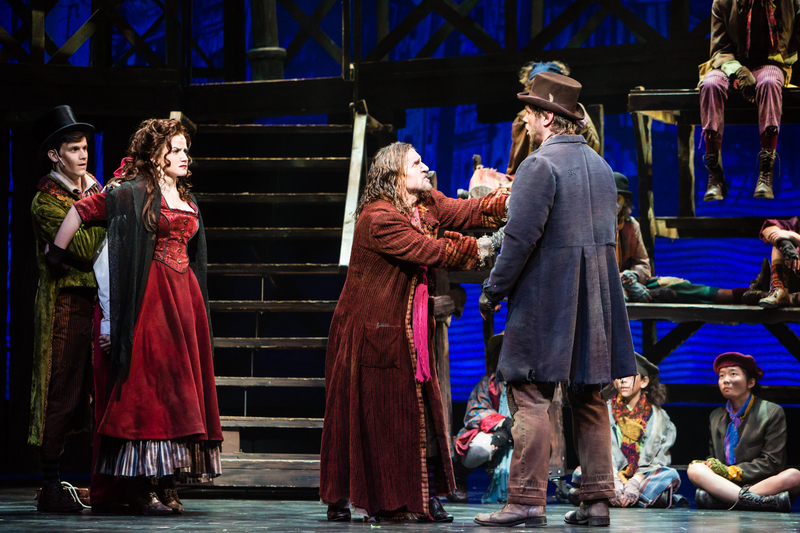 Choreographer, Dana Lewis, has both young and old members of the cast dancing beautifully, and the period costumes of designer, Colleen Graddy, nicely capture the atmosphere of this Dickensian world. 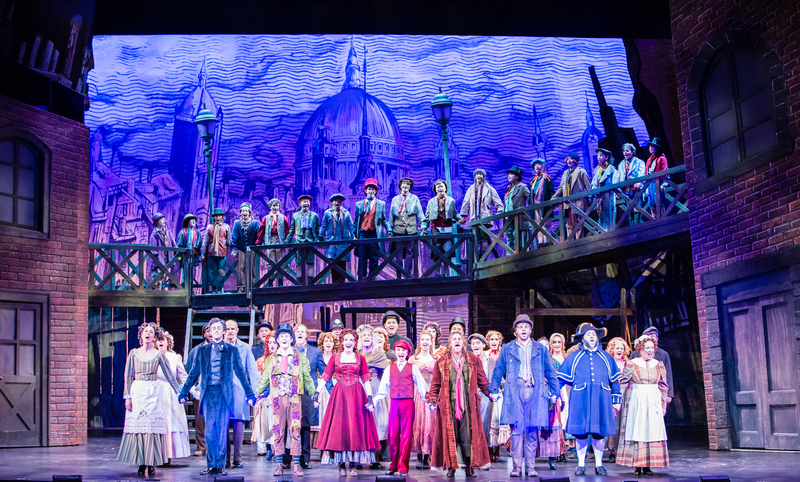 A rousing “Oom-Pah-Pah” from the Cast of OLIVER! OLIVER! Continues through April 17th at Houston’s Hobby Center main stage with performances Wednesday & Thursday at 7:30 pm, Friday & Saturday evenings at 8pm, Saturday and Sunday matinees at 2pm, and a final performance next Sunday evening at 7:30 pm. For tickets visit the website at www.TUTS.com, or call (713) 558-8887 locally and (888) 558-3882 (outside of Houston). This entry was posted in Broadway, BroadwayStars.com, Charles Dickens, Conroe Courier, HERE HOUSTON-Lifestyle & Entertainment, Houston Community Newspapers online, Houston's Hobby Center, Lionel Bart, Oliver!, The Courier Columns, The Villager Columns, Theater Under the Stars, ThePeoplesCritic.com and tagged Broadway, musicals, Theatre Under the Stars. Bookmark the permalink.